Supreme Court nominee Brett Kavanaugh during his Senate Judiciary Committee confirmation hearing in Washington on Sept. 6, 2018. (Bloomberg photo by Andrew Harrer). WASHINGTON – Senate Republicans are pressing forward with Brett Kavanaugh’s nomination to the Supreme Court, showing no signs of hesitation after he “categorically” denied a decades-old sexual misconduct allegation that has roiled the final days of an already rancorous confirmation fight. The letter says that Kavanaugh and the woman went into a room along with a friend of Kavanaugh’s, and that Kavanaugh allegedly held her down, according to the person, who spoke on the condition of anonymity to discuss a sensitive matter. She said she escaped from the room. 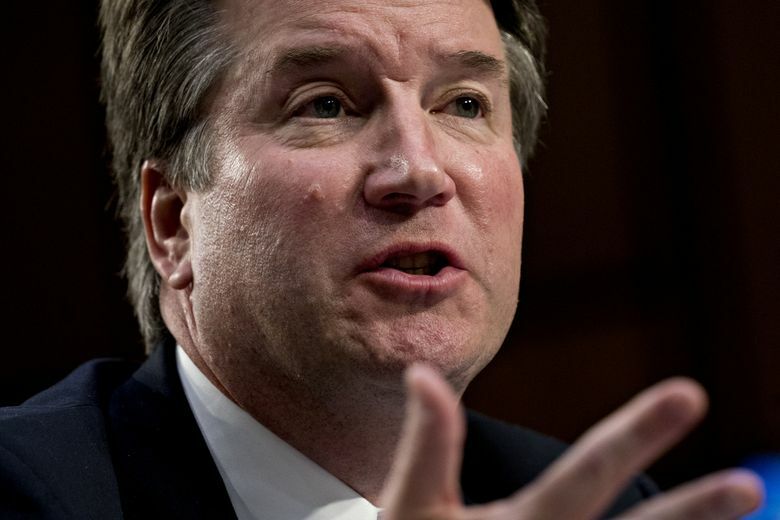 The sudden disclosure of the allegation against President Donald Trump’s Supreme Court pick has only raised more questions, particularly about how the information had been handled as Kavanaugh’s confirmation progressed steadily through the Senate. His fate now hinges on the decisions of a handful of undecided senators, particularly two Republican women – Susan Collins, Maine, and Lisa Murkowski, Alaska, – who support abortion rights and now have to weigh the allegation in an era in which awareness of sexual harassment and misconduct have come to the forefront. White House officials spent the day making calls to senators and aides to determine what impact the letter will have on Kavanaugh’s nomination and whether it might blow it up, according to a senior administration official. As of now, White House officials do not believe it will. But Sen. Orrin Hatch, Utah, the most senior Senate Republican who has read the letter, said “every accuser deserves to be heard, but a process of verification is also necessary.” The GOP-controlled Judiciary Committee reiterated Friday that it would hold a panel vote Sept. 20. Earlier Friday, Kavanaugh held what could be a pivotal phone call with Collins, who is publicly undecided. The phone call lasted about an hour, according to a spokeswoman, who offered no details about the conversation – including whether Collins asked about the allegation. The developments snowballed this week after Feinstein released a cryptic and vague statement Thursday saying she had referred “information” about Kavanaugh to federal authorities. She did not detail the material she had, citing confidentiality concerns. The FBI does not plan to launch a criminal investigation into the matter and instead sent the material to the White House to be added to Kavanaugh’s background-check file. Within an hour of receiving it, the White House sent that updated material back to the Senate Judiciary Committee, where the information is limited to senators and a tight circle of senior aides. Meanwhile, Kavanaugh’s allies moved aggressively to defend the nominee and push back against the allegation. A group of women who said they knew Kavanaugh in high school made contact late Thursday afternoon with several of the nominee’s former clerks who are helping in Kavanaugh’s confirmation process. The women had seen news reports about the allegation against Kavanaugh, and the husband of one of the women had been contacted by a reporter who was looking into the accusation. The women offered their help, and eventually the group decided to draft a letter defending Kavanaugh’s character, according to a person involved in the process. The list of signatories grew quickly as the women contacted their own friends, who in turn contacted others who knew Kavanaugh in high school, the person said. By Friday morning, the letter had 65 signatories and was sent to Grassley’s staff, which then swiftly blasted it out to reporters. Kavanaugh’s confirmation – which could cement a conservative majority on the Supreme Court for a generation – depends on five or so senators who have yet to announce how they will vote, even as the political battle over the nomination escalates. Aside from Collins, Murkowski also remains publicly undecided. Three Democratic senators who helped confirm now-Justice Neil Gorsuch last year – Heidi Heitkamp, N.D., Joe Donnelly, (Ind., and Joe Manchin III, W.Va., – are up for reelection this fall in Republican states and are under intense pressure to side with a Trump Supreme Court pick again. Another moderate senator, Doug Jones, D-Ala., also has not announced his position on Kavanaugh. In recent days, Jones contacted the Judiciary Committee to ask to look at various Kavanaugh documents as he continues to deliberate, according to a congressional official. Jones was elected in December in a deeply Republican state and did not vote on Gorsuch’s confirmation. Gorsuch was confirmed in April 2017. Judiciary Committee staffers noted that Kavanaugh has undergone six FBI background investigations in a public-service career that began in 1993. No such sexual misconduct allegation had surfaced in those probes, Republicans said, and Grassley’s staffers said no such claim had been reported to them or to the 10 other GOP senators on the Judiciary Committee. Meanwhile, Feinstein did not attend the closed session of Kavanaugh’s confirmation hearing last Thursday, a venue in which sensitive information can be discussed. The sexual misconduct allegation did not come up during the closed session, Republicans said. Mentzer, Feinstein’s spokesman, confirmed that she missed the late-night session and said she had not been feeling well. Feinstein, who is up for reelection this fall, came under intense criticism for her handling of the matter by opponent Kevin de León, a California state senator who has been running to Feinstein’s left. At that hearing last week, under questioning by Sen. Mazie Hirono, D-Hawaii, who asks a specific question of all nominees who come before the committee, Kavanaugh testified that he has never committed “any verbal or physical harassment or assault of a sexual nature” since he became an adult.